We don't get very many chances to see our favorite NCAA Division I basketball team play in person. Most of the time, it's hard to even catch them on television, as the mid-major team is based in Fargo, ND. Although, Kyle still roots for Illinois and I'm still a Missouri Tiger at heart, we've adopted a new team over the past two seasons, the North Dakota State University Bison. And let's face it, they're much more fun to watch than the Illini or the Tigers the past few years. Princess Grace in the lobby of our hotel room. It was just too cute not to share! Our journey to the green and gold team started when Hillsboro High School senior Dylan Miller helped Grace "dunk" the basketball at a game Kyle was covering. The 6'7" Miller would go on to join the Bison, and we have been fans ever since. Last year, we had the chance to see them play twice in person, once when they played the Illini in Springfield and another time for a conference game at Western Illinois University in Macomb. When the schedule was released for this season, Kyle immediately put their game at Western on our calendar, and we started making plans for a return trip to Macomb. The three-hour drive definitely requires an overnight stay on our part, and it's still much closer than going all the way to Fargo. 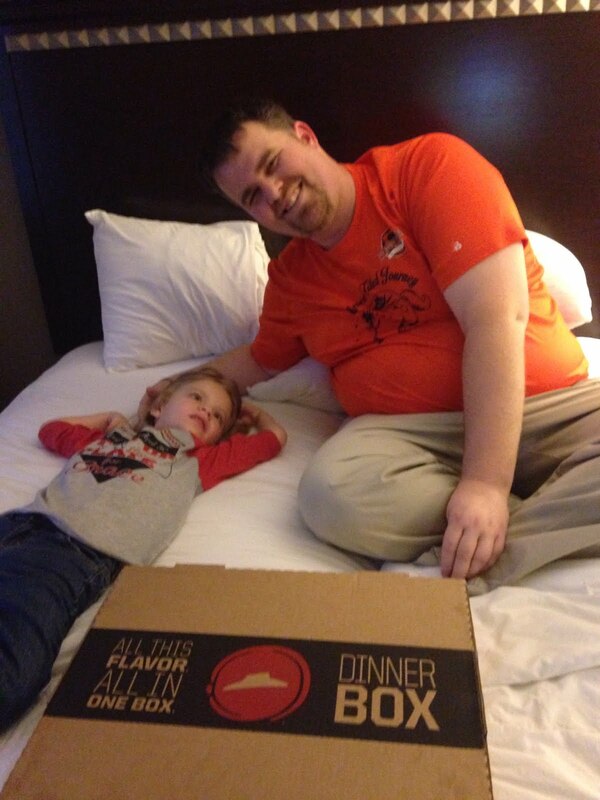 We had pizza delivered for dinner - and it was great! We decided this year that we would go up on Friday night before the Saturday game. Grace had physical therapy in Springfield, so we were already a good portion of the way there, and it gave us a chance to relax on Friday evening. Originally, we had planned to take Grace swimming at the hotel, since that's one of her favorite activities. However, the pool at the hotel was closed for repairs, so we opted for a movie instead. Grace loved listening to the music during the movie "Sing." Kyle and I had been wanting to take Grace to see the animated movie Sing, and it was perfect opportunity. 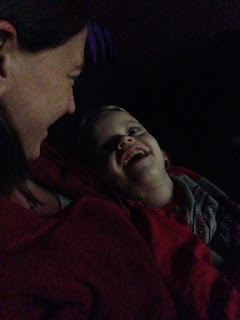 We made sure to sit pretty close, and although I'm not sure how much of it Grace could see, she definitely enjoyed all the music, and we enjoyed the chance to be together. 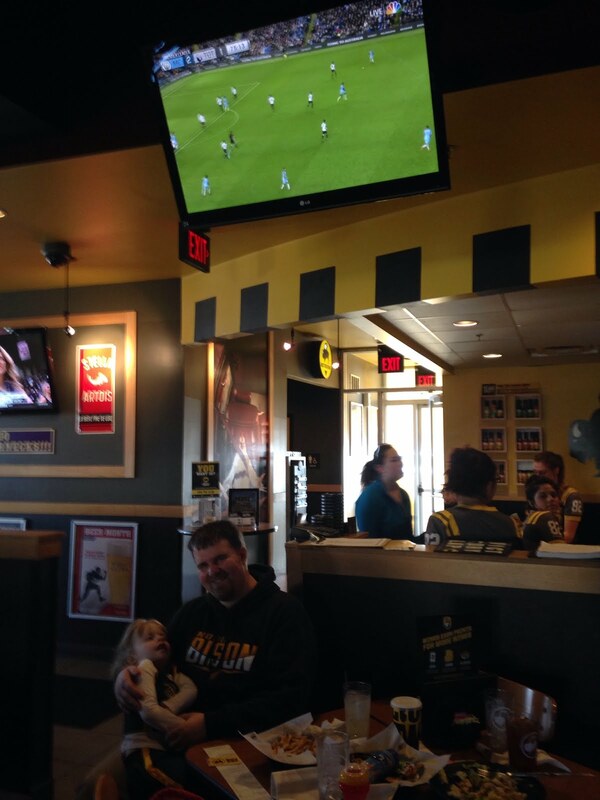 Watching our Spurs play at Buffalo Wild Wings. We enjoyed a pretty lazy Saturday morning in the hotel room, before stopping for lunch at Buffalo Wild Wings to watch Kyle and Grace's Tottenham Hotspur play in the English Premier League game. The food was great, and it was fun to watch the game together too. 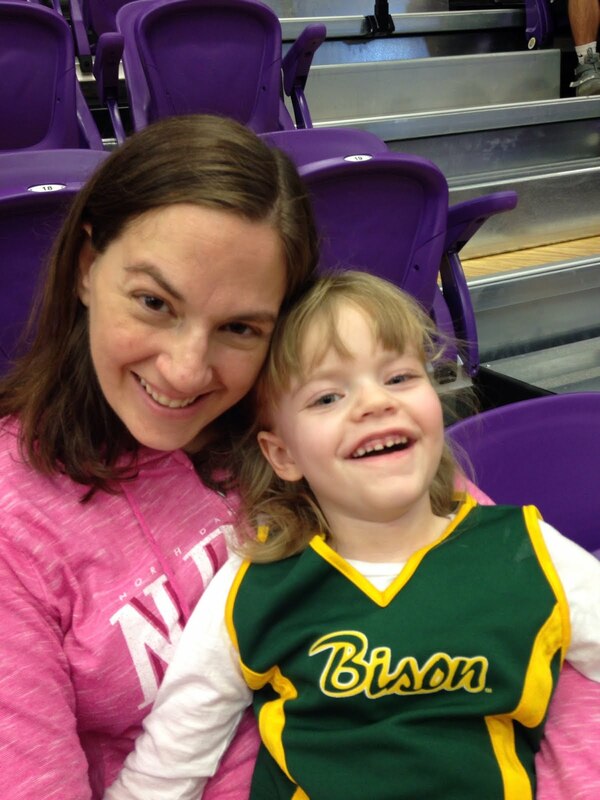 Hanging out with my favorite Bison cheerleader! After having lunch, we headed back to the campus at Western Illinois University to get ready for the game. We picked seats right behind the North Dakota State team bench, and waved at Dylan as he and his team got ready for the game. Grace looked awfully cute in her Bison cheerleading uniform and seemed to enjoy the people that came over to talk to her. 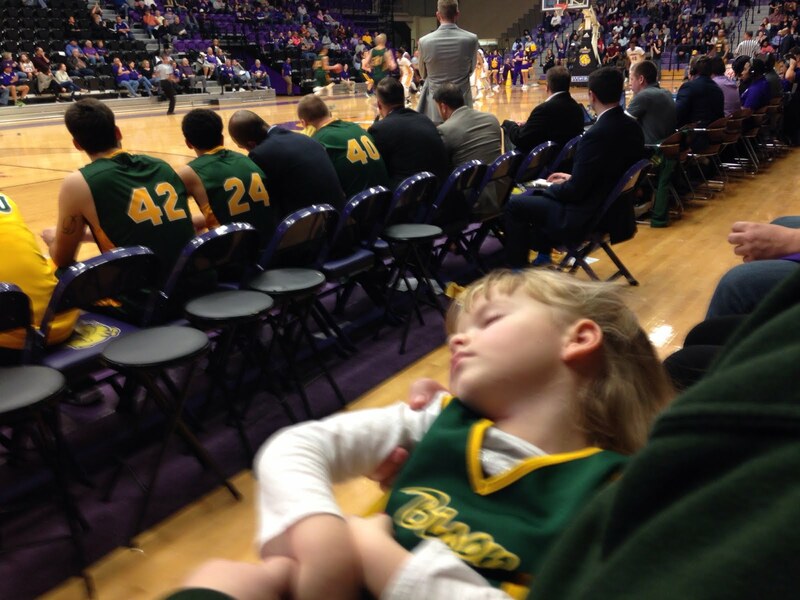 Someone fell asleep on daddy's lap during the game. Kyle had a chance to visit with our friend, Wes, who is an assistant athletic director for the team, and has followed our story since the very first game we saw. We brought a couple of Grace scarves for Wes and his wife, as a thank you for all they have done for us. 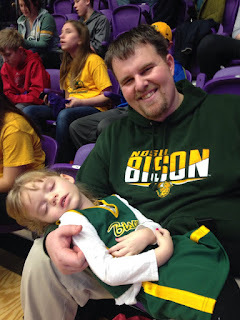 Daddy and his tired little Bison fan. 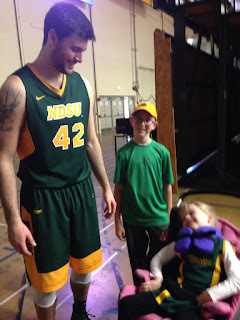 Once the game got started, Dylan took the tip off for the Bison. Grace and I cheered from our seats and Kyle took a spot on the sideline to take some photos for the paper. It ended up being one of the best games Dylan had this season, and Kyle got some awesome photos of him dunking the ball in the first half. Kyle joined us in our seats for the second half, and Grace promptly fell asleep in his lap for a good portion of the game. Dylan was so gracious to come over and talk to Grace after the game. We have really enjoyed the chance to see the Bison play in person and meeting some members of the team. After the game, Coach Richman stopped by to thank us for coming, and Dylan made a point to come over to thank us too. He talked basketball with Kyle for a little bit, but specifically stopped to talk to Grace and ask her if she enjoyed the game. Even though she couldn't respond with words, she had a huge smile for Dylan, and I know she was glad he came to talk to her. Kyle got this awesome shot of Dylan during one of his dunks. Even before we learned that Grace had INAD, we tried hard to share as many experiences with her as possible. And we've had some really great chances. 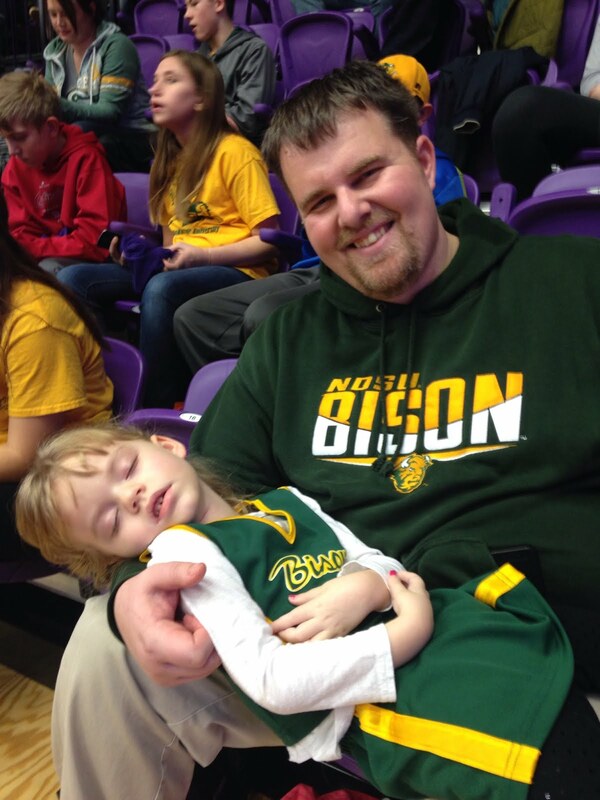 Although we've adopted the Bison as one of our favorite teams, we feel like they've adopted us too. Since Fargo is a 12-hour drive, we may not have very many more chances to see them to play in person, but we know we'll be on the sidelines next January when they head back to Macomb. We wouldn't miss it for the world. As we turn the calendar over to another year, we can't help but be grateful for all the therapists who help keep Grace at her best each and every single day. Although Grace's disease is regressive and keeps her from making much long-term progress in therapy, the weekly sessions help to keep as many of her skills as possible and also keeps her in good health. 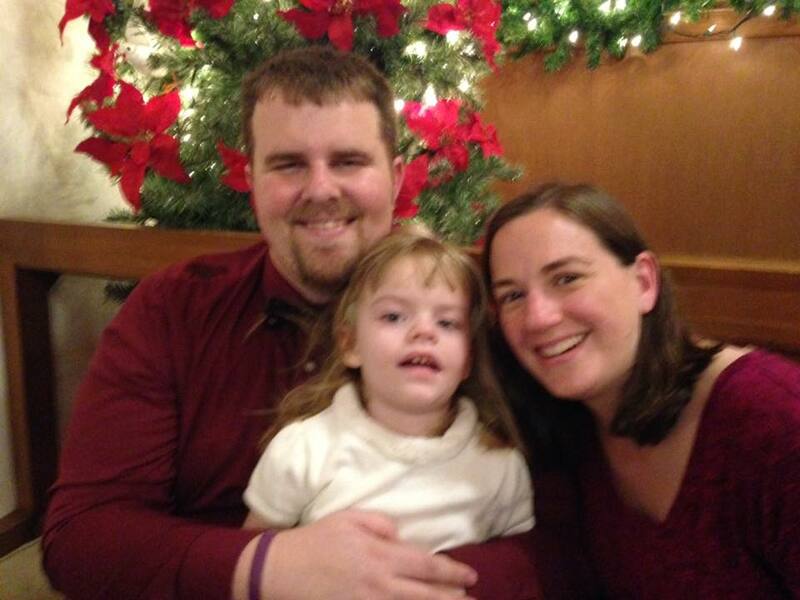 Our journey into the world of therapy started about four years ago when Grace was just 18 months old. She could take a few steps independently, but never really started walking on her own. So, we began to inquire about the Early Intervention birth to three program, and the possibility of helping Grace catch up on meeting some of her milestones. 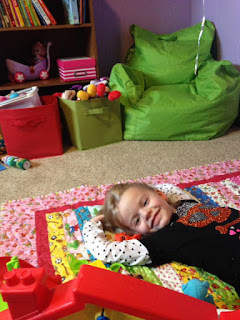 At the time, we thought Grace would only qualify for physical therapy, but a developmental screening was required as well, and we discovered Grace wasn't meeting all her milestones for fine motor skills either. You can see the mutual admiration for each other as Amy works with Grace on standing last year. For the next year and a half, Grace had therapy three times a week, including physical therapy, occupational therapy and eventually speech therapy at our home. It's funny how quickly these therapists become part of your extended family, as they celebrate successes with you and try to come up with the best ideas to help your child succeed. In the beginning, we had no idea that Grace would be diagnosed with INAD, and we worked hard with her every day trying to help her catch up on her milestones. And she made progress in building trunk and core strength for several months. 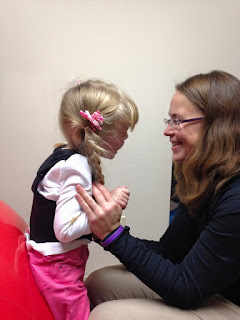 As she continued not to be able to walk on her own, we sought additional physical therapy, and got some good recommendations for a pediatric therapy place through Memorial Medical Center in Springfield. We've been seeing Amy nearly every Friday for the past three years. 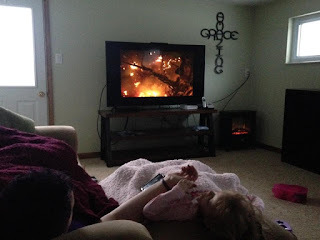 Again, we started going once a week about a year before we learned Grace had INAD. When we first started, there was this blue barrel that Grace just loved to walk around, over and over again. Amy worked hard with Grace (even when Grace protested) to help her move toward the goal of independent walking. She was always trying new things and sharing her experiences with us. Grace just giggled when Lauren helped her knock the tower over in speech therapy. About six months after we started physical therapy in Springfield, we began to inquire about additional physical therapy to help Grace out. The only problem with that, is that Springfield is about an hour from our home, and we just couldn't get there more than once a week. 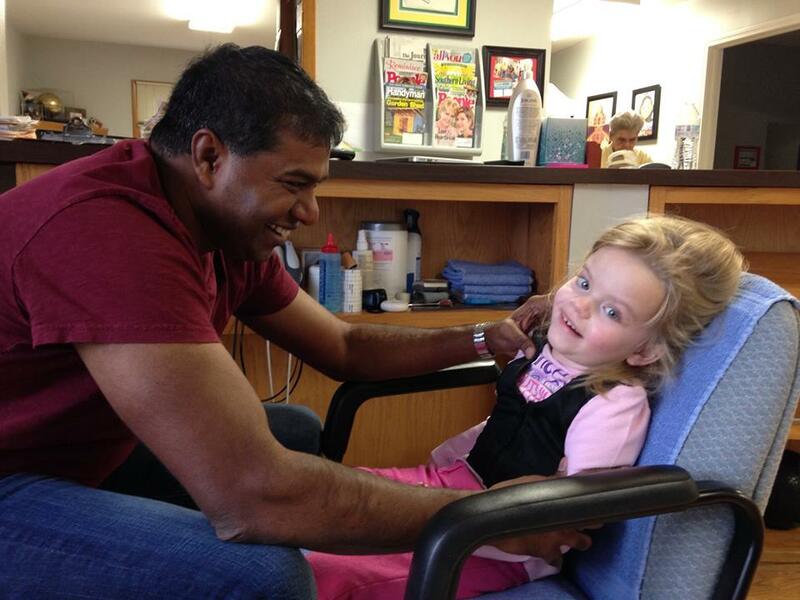 So, we looked into other options closer to home, and started Grace seeing Dr. John Mekala at RehabEdge in Hillsboro. We heard he had quite a bit of success with young patients, and he was more than happy to start seeing Grace. When we first started, Grace would hold onto his fingers and walk from one end of his office to the other. She protested when he made her do things she didn't like, but he always believed she could do it. And I think he still does. Dr. John also works hard to keep her spine in alignment, as scoliosis can become a major problem for INAD kids. As Grace turned three, she aged out of the Early Intervention program, and we looked into the school district's pre-Kindergarten program. As we were very happy with the physical therapy Grace got twice a week, we were mostly interested in getting her some additional speech therapy. All our therapists told us that for most kids, the gross motor skills (like walking independently) come first, following by more fine motor skills and then speech. They felt like if Grace could get walking on her own, her speech skills would follow. We ended up deciding to send Grace to a preschool program three days a week at our church, instead of the school district program, but that left us without any speech therapy. It just so happened that the friend who introduced us to Kids at Koke Mill in Springfield was also a speech therapist for TeamWork Rehab at Hillsboro Area Hospital. And we made an appointment for a screening with Grace. I can remember the very first thing she worked on with Grace was trying to get her to say "I Love You." It wasn't long after we started that speech therapy, that we learned Grace had INAD, and would probably never gain any of the skills we had spent the last 18 months working so hard on. The thing about therapists is that when you see them each and every week, they truly do become part of your family. They help you celebrate all the little successes and milestone along the way, but they also share in your heartbreak. We just so happened to have therapy with Amy the day we found out she had INAD, and I think it broke her heart as much as it broke ours. Initially, Kyle and I talked about backing off some of the therapy we did every week. 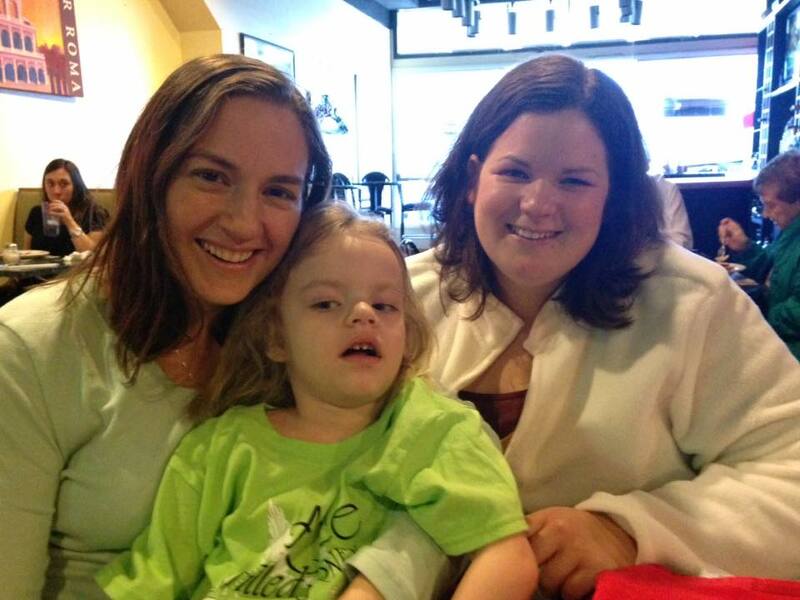 At the time, she had speech therapy twice a week at the hospital, and also saw John and Amy once every week. We talked about maybe letting go of our weekly Springfield visit because it's such a big commitment to take her so far every single week. 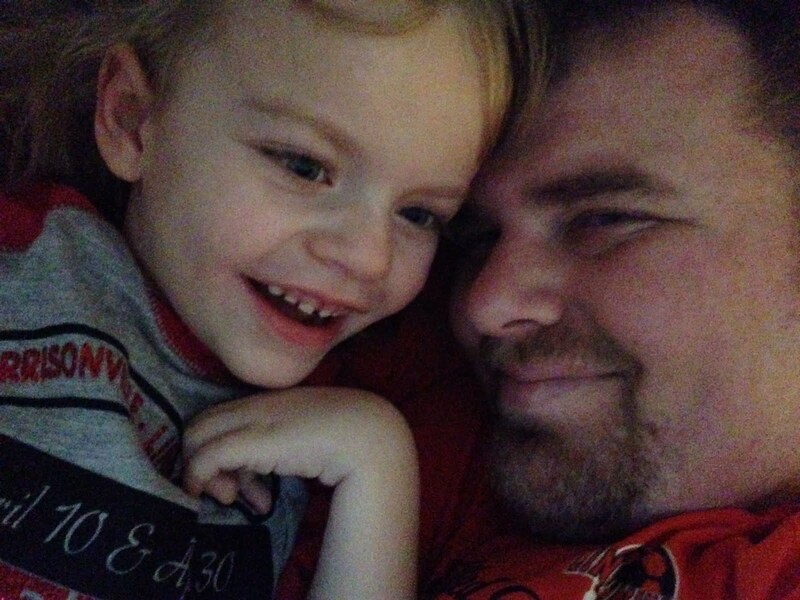 We talked about going down to just one time a week for speech therapy, just to make it one less place we had to go. Grace loves when Amy helps her stretch out on the ball. 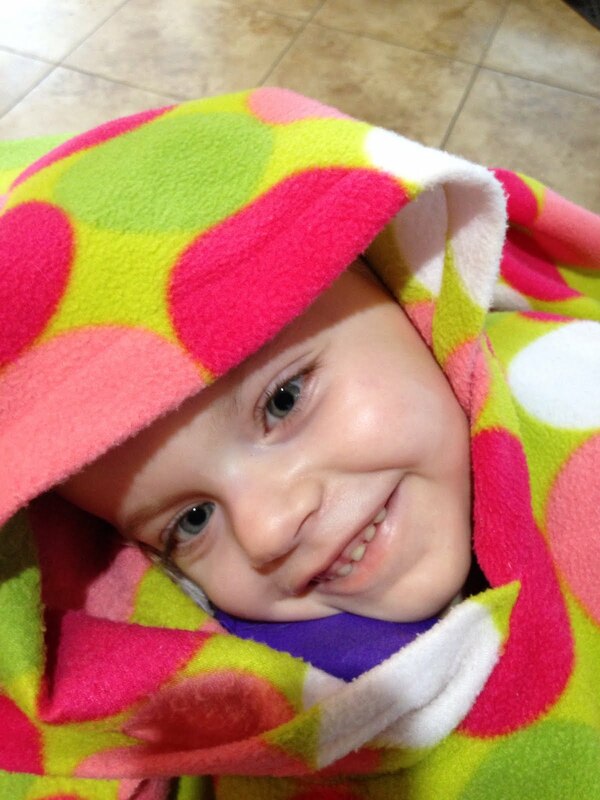 But the more we prayed for a miracle for Grace, the more we realized that we would still have to do our part too. We couldn't pray for her to get better, and then not utilize the tools at our disposal. For the last couple of years, Grace has qualified for an All Kids insurance card, which covers all the therapy she needs, and we are so grateful for that, because it means we don't have to worry about getting her covered. And while Grace's therapists were just as devastated as we were to learn she would probably never walk on her own or talk, they never stop trying to find new things that will help her. Amy went all the way to Arkansas for a special training on a BalanceWear vest, that helped Grace improve her head and neck control for awhile. 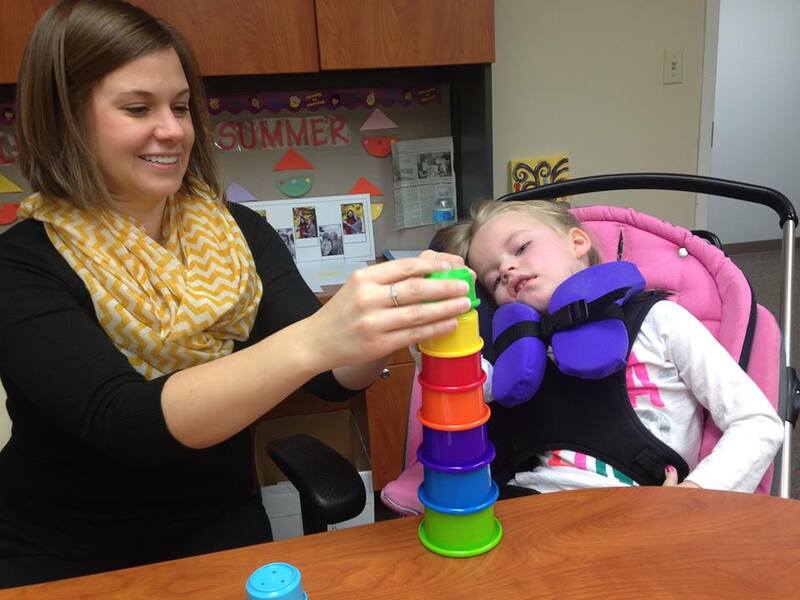 In speech therapy, Lauren just started doing some additional oral stimulation to keep her skills for eating strong. Grace isn't a huge fan of it, but we feel like it's still important. It would be easy to throw in the towel and give up taking Grace to therapy every week. After all, as the disease progresses, it keeps her from reaching any longterm goals. When we started physical therapy, our goal was for Grace to walk on her own. She could take a few independent steps and was a champ at walking with her posterior walker or with a little help from mom or dad. 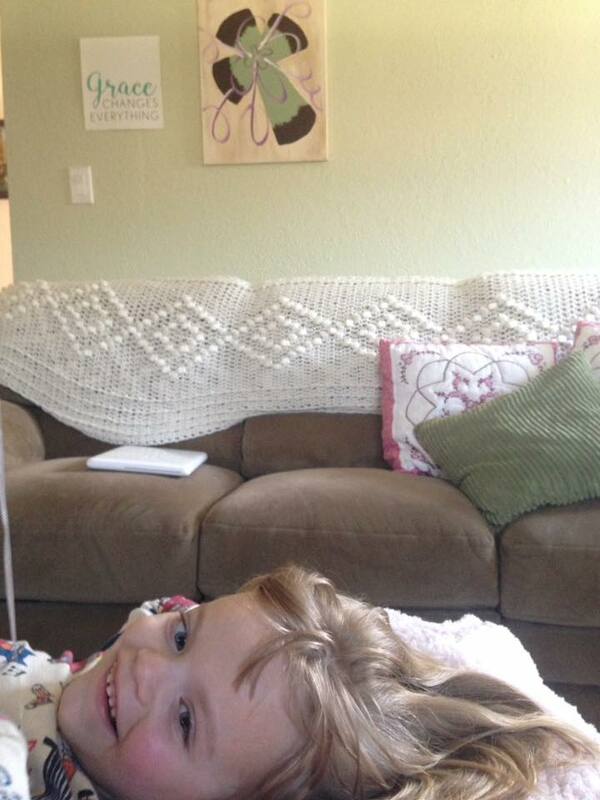 Now, three years later, Grace isn't even able to sit up on her own, or hold her head up without help. Yes, it would definitely make my life a lot less complicated not to find time to work in three therapy sessions every week, as well as three mornings of preschool. But we know that's not what's best for Grace. She may not make any long-term progress, but she does still meet little goals, and her therapists continue to celebrate those small successes with us each and every time. They never stop trying just because Grace won't be able to walk or talk. They continue to push Grace to her potential, never giving up on her, in spite of her limitations. There's definitely no quitting on this Grace-filled journey, and we are so grateful to those who help us keep Grace happy and healthy along the way. This job has often times taken me out of my comfort zone. 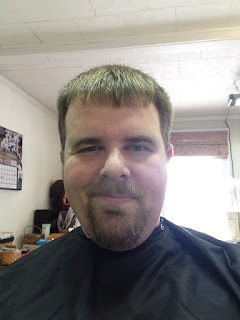 Introverted and quasi-antisocial even during my first two decades on this planet, I have been forced to become more of a social butterfly than I ever dreamed possible. The latest leap out of my comfort zone culminated on Friday, Jan. 6, as I paid off a debt to the students of Litchfield High School. Two months ago, I challenged the student sections of the four Montgomery County schools to raise the most money for the Montgomery County Cancer Association. There is hardly a person that hasn't been affected by cancer in some way, myself included as my Grandma Virginia has battled the cancer twice. In return for their fundraising? 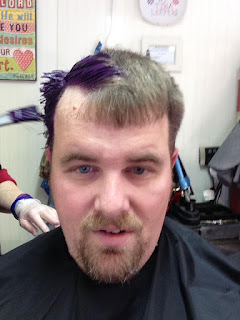 I'd dye my hair the school color, a pretty big step for someone who has been some flavor of blonde/brown (and even some gray now) for his entire 35 years. 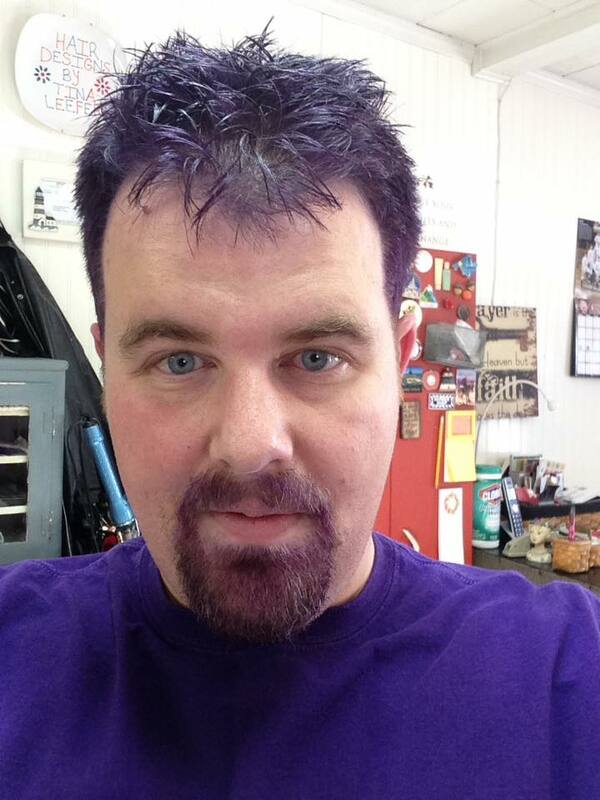 Tina just starting to color Kyle's hair. With a deadline of Dec. 16, the students of Hillsboro, Litchfield, Lincolnwood and Nokomis jumped at the opportunity to see me sporting a new color scheme, raising close to $3,000 for the MCCA. The response continues to overwhelm me long after the donation period has finished. The creativity, compassion and enthusiasm of the students, the teachers and the administrators of these schools has been amazing. I'd like to particularly thank Lincolnwood Athletic Director Josh Stone, who printed out a large (and I mean LARGE) photoshopped poster of me with orange hair. Litchfield Athletic Director Pat Reents and Coach Jason Cooper were also big parts of the drive at Litchfield, which raised more than $1,300. The Panthers even had a side challenge, hoping to cut student John Kim's flowing locks if they raised $2,000. Showing off the new look at the game. Nokomis Principal Rachelle McDowell, Hillsboro Athletic Director Joe Vanzo and Hillsboro Principal Janet Ward also lent their support, with Mrs. Ward suggesting that next year I become a male cheerleader for the winning school. It's a great idea, but it's not going to happen. The only "grace" I have shares my last name and I would hate to degrade the efforts of the county's cheerleaders by having me perform with them. Also I look terrible in spandex. Grace wore one orange pig tail and one purple pigtail to support both our local teams. 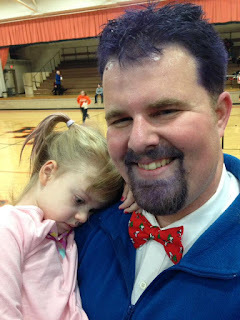 That brings me back to Friday, where I was able to debut my new look, expertly given to me by Tina Leefers, at the Litchfield/Hillsboro boys basketball game. I received a lot of odd looks, but even more positive comments, which helped ease my nervousness about looking like a cross between a Batman villain and the bass player for a Green Day cover band. 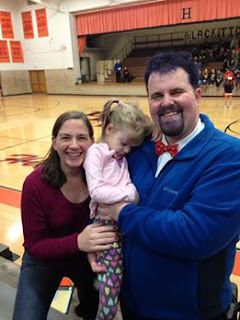 Having my beautiful wife Mary and our daughter Grace, who sported one purple pig tail and one orange pig tail to show support to our local teams, with me also really helped. Ultimately, all of the questions and strange looks are completely worth it. 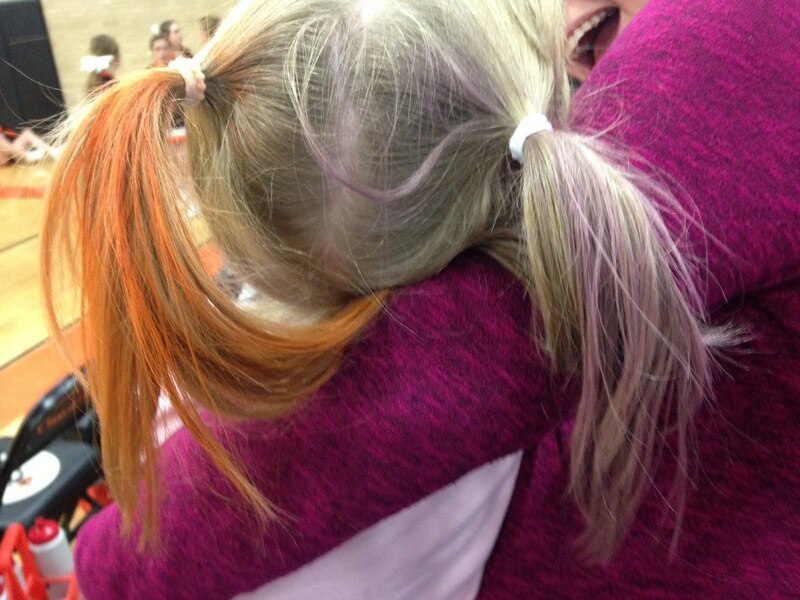 The fundraising contest not only raised a lot of money for a good cause, but it also helped encourage students to recognize that there are a lot of things out there in the world that are bigger than what goes on in the walls of there school. Family photo opportunity at the game. My hair will fade eventually, but the impact the students made won't. My wife and I know what a great place Montgomery County is. We've seen it first hand through the love and support of our community for Grace and her battle with Infantile Neuroaxonal Dystrophy. To think that this project may have helped foster the next generation of the generous citizens of Montgomery County makes me excited for the future, no matter what tough times may come. Hopefully I can come up with another idea that the students will take to even more next year. If anyone has any ideas for next year's challenge, you can send them to me at JNsports@consolidated.net. Except for you Mrs. Ward. As Grace and I carefully packed up the Christmas tree and ornaments and the nativity scene, it seemed hard to believe that another Christmas had come and gone. Although it was a busy week or so, it was wonderful to see so many of our friends and family. We feel blessed to be surrounded by such love each and every day. Family photo after our Christmas Eve service. We had a relatively calm Christmas Eve, enjoying time at home just the three of us. After finishing wrapping the presents, we created a gingerbread house together and made some family memories. Kyle helped Grace open a new sign for her playroom. Grace was excited that mommy got the new Ghostbusters movie. Kyle was excited for his new Fight the Fight shirt. Mommy got a new necklace with the names of both her girls. Our only real plans that day were a Christmas Eve service at our church after dinner, and we joined my mom and dad for the candlelight service and to sing some of our favorite songs. My favorite part is when they turn off all the lights in the sanctuary and we light candles and sing Silent Night. Kyle snuggled Grace and watching the two of them in candlelight was very special. After extinguishing our candles, our pastor reminded us to be the light into the world during Christmas and beyond, a special message for sure. After church, we decided that since Santa had already visited our house, it would be okay to open presents just the three of us. Santa left a few fun things for Grace, like the movie, Finding Dory, a new book called, "Have You Filled a Bucket Today?" and her very first Precious Moments. Mommy got daddy a new Fight the Fight shirt, and daddy got mommy a necklace with the names of both our girls on it. I might have cried a little. In the hectic days of the holiday season, it's always so nice to have a little time to celebrate just the three of us. Making homemade pizza with Grandma Kim. Somebody was excited about a new soccer ball. My two goofballs at Christmas. On Christmas morning, we woke up early to head to the Atwater Christian Church with Kyle's family. We might have tripled attendance at the church by the time his family all arrived, but it was fun to share in the service together. Once the service was over, we headed back to Kyle's mom and dad's house for lunch and to open presents. We enjoyed watching our nephews excitement as they opened their packages to find trucks and tractors, and other things that made lots of noise. Grace snuggled up in her wagon and watched as we opened presents for her. She was so happy just to be with everyone. And we were too. The nice part about having both of our families so close in proximity is that we got to stay and visit for awhile before heading to dinner with my family. It was relaxing and fun to get to catch up some. Cheesing with Papa John and Grandma Susie. Uncle Johnny liked his Grace-filled journey glasses. Kyle was excited about his new Pentagon shirt. Grace's baby sister got a new Bitty Baby. She definitely sparkles and shines. But all too soon, it was time for another stop, and we packed up all our goodies and headed back to Hillsboro for dinner. My brother and his wife were driving down from the Chicago area, so we all met at mom and dad's for dinner and more presents. Again, it was nice and relaxing just to sit around and visit for awhile. Hanging out with the Barkley girls. Lunch at Gianni's with our friend, Kristin. 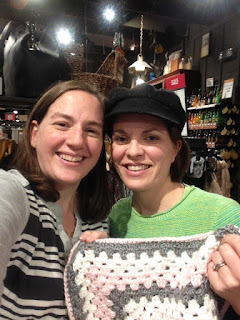 Dinner with Karen, and she made a snuggle blanket for the baby. And though the holidays prove to be busy, we always enjoy getting to see family and friends even if it is brief. The day after Christmas, we got a visit from my friend, Nicole, and her two girls, and then had lunch with my cousin, Stef, and her parents. The next day marked the Galer family Christmas at my aunt's house, which meant more great food and presents too. It was fun to see the kids open their presents, and to snuggle with Grace, who really just enjoys all the attention. Galer family Christmas: Johnny and Keith. Galer family Christmas: Grace and Izzy. The new babies got matching onesies! We ended the week with lunch with my friend, Kristin, and dinner with a college buddy, Karen, who was in the metro area with her family from Mississippi. As we closed out the week, we headed to Farmersville for a family-friendly New Year's Eve party with some friends. The kids sang karaoke and played together, and we had a chance to catch up with everyone, while we rang in the new year. The visits aren't always as long as we hope they would be, and Christmas seems to come and go very quickly. However, we share the love and hope they bring us all year long. Thanks for everyone who made time to see our family over the holidays, and we wish you all the best in the new year. Herschelmans on New Year's Eve! 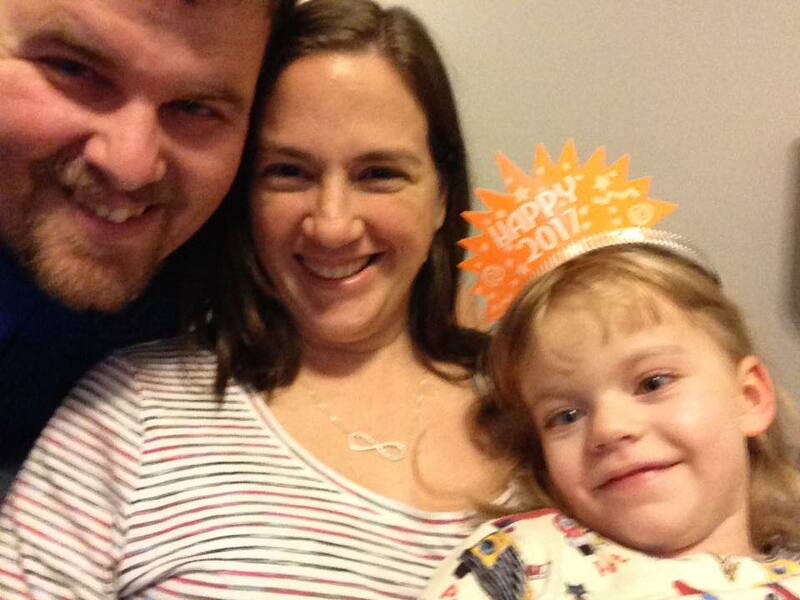 Kyle and I have decided that we aren't really big into resolutions, but our goals for the new year include raising more awareness and funding for INAD, welcoming a new little girl into our family and making memories as a family that we will remember forever. And we're so grateful to everyone on this Grace-filled journey.